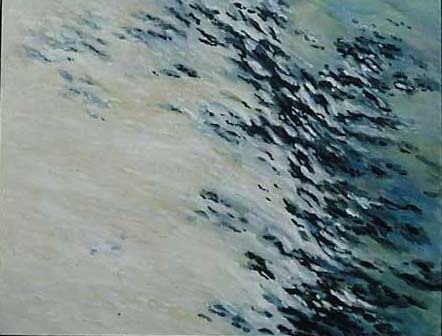 These paintings refer more realistically to rushing sweeping water and light. Water rushing across the field of vision, -- familiar, momentarily recognized at times imagined, more than perceived, tumbling sparkling and bubbling. The water formations are fleeting impressions, motion and light suddenly arrested to define a moment in time-a view of their beginning or ending.